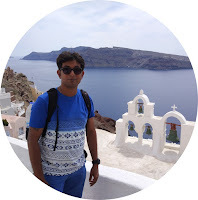 One of the most amazing beach destination in the world which offers great beaches , excellent food and exciting nightlife and that too on a budget. Its Phuket !!! 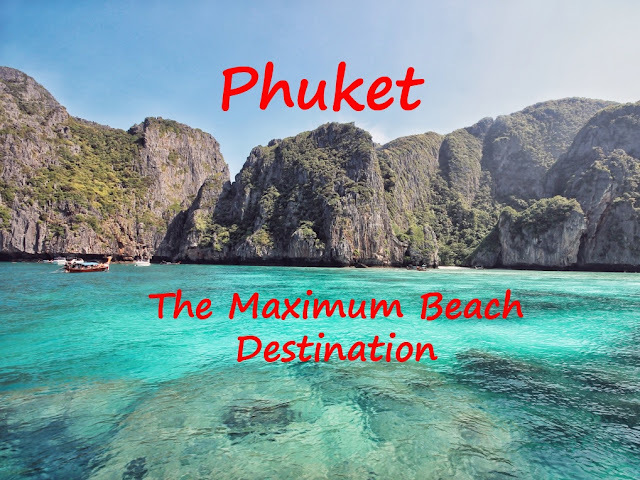 Very few beach destination in the world offers the variety that Phuket offers to the travelers. You can enjoy the Maximum beach destination as I call it without breaking your bank. Phuket is 850 Kms from Bangkok. If you plan to go by flight then it will take approximately 1Hr 30mins and on road you can reach Bangkok in an overnight bus. The cost of reaching Phuket by flight varies from $60-$70 depending on when you book the flights. The buses from Bangkok to Phuket takes approx 12 hours to reach and costs approx $30. (The bus terminal is at Phutthamonthon Sai Road in the city’s Thonburi district on the western banks of the Chao Phraya River. Although it’s between 30 minutes and an hour’s taxi trip from downtown dependent on traffic, all taxis and songthaews know its location). Many also depart directly from Khao San Road, with the overnight service being particularly popular. Shoestringtravel recommends VIP buses offered by either the government companies.Get your bus tickets directly from the bus terminal to ensure that the bus you are taking is actually VIP bus and not a bus showcased as VIP by the various travel agents. Don't forget to carry a jacket or a sweater in the bus as generally the air condition is kept at the lowest temperature. Hostels in Phuket are really cheap starting at $10 for a double sharing private room , however be ready to share bathrooms. If you don't like staying in hostels then there are many budget hotels in Phuket as well as many 5 star hotels. The cost of staying in a good hotel with a big room , air condition and basic amenities whill cost you from $20. Try to stay near Bangla Road or Patong Beach as you will be in the heart of action. 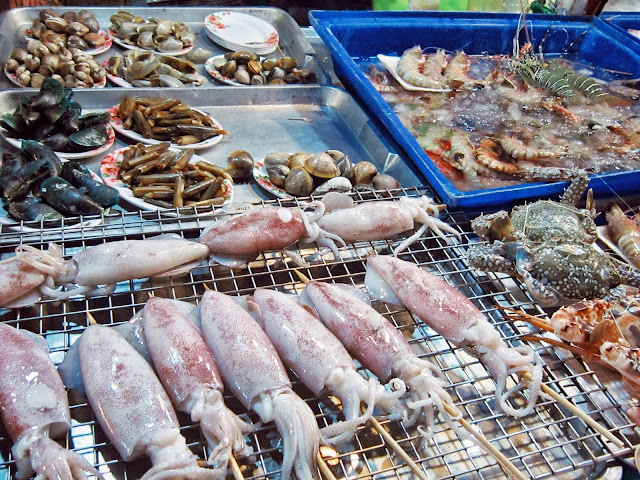 Food is dirt cheap in Phuket unless you are planning to splurge in a fine dining restaurant. There are many street vendors selling delicious food. Budget around $3-$5 per meal and you will be done. We will discuss about where you can get cheap but delicious and hygienic food below. 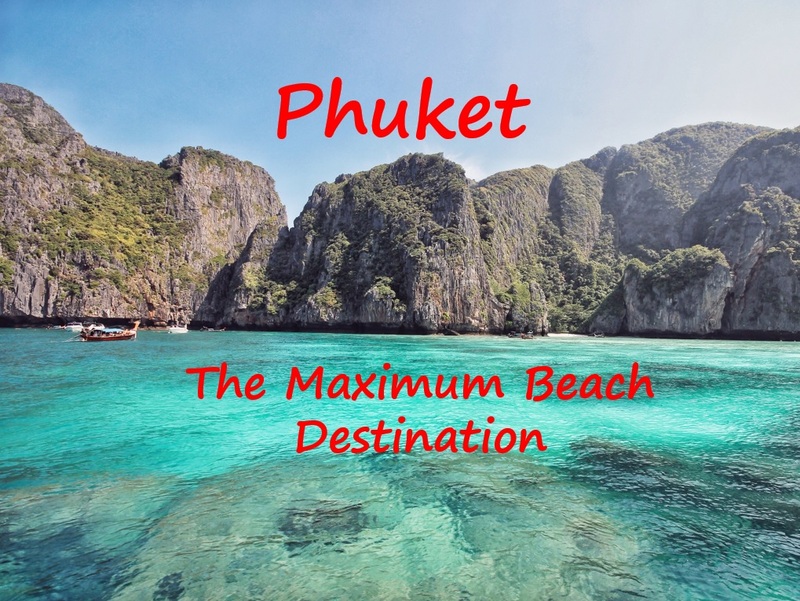 I like calling Phuket the maximum beach destination and there is a reason behind it. Whatever you can imagine in a beach destination you can find in abundance here.You will never get bored of options. So below are the things you should experience for a perfect beach vacation in Phuket. 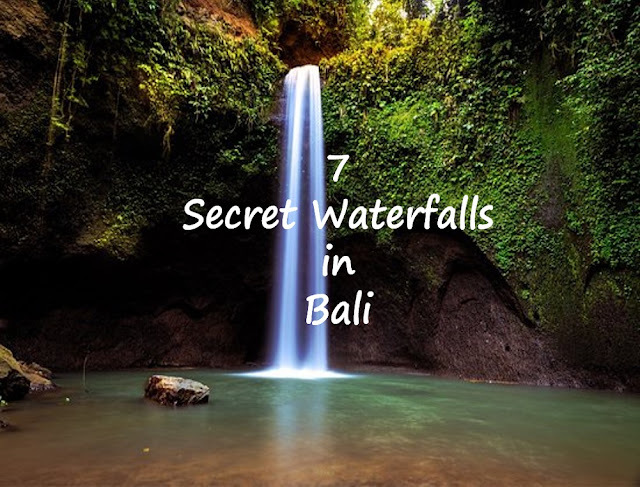 The list is endless, if you can experience the things mentioned here I can assure you , you will not only return with a bucketful of memories but also will yearn to go back to Phuket again. 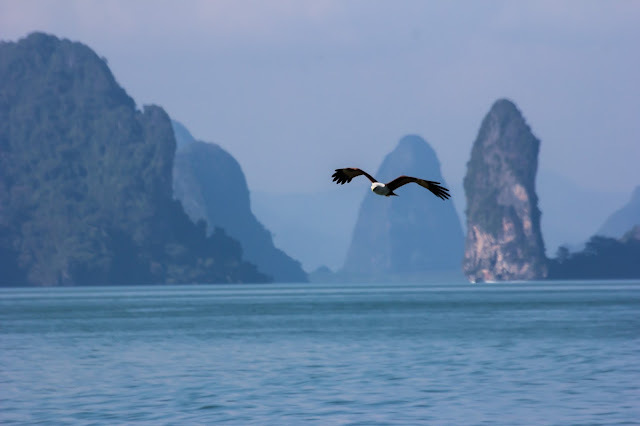 Phang Nga Bay is famous for its fascinating and beautiful limestone karst islands and caves. It's no accident that two James Bond films have been filmed here. 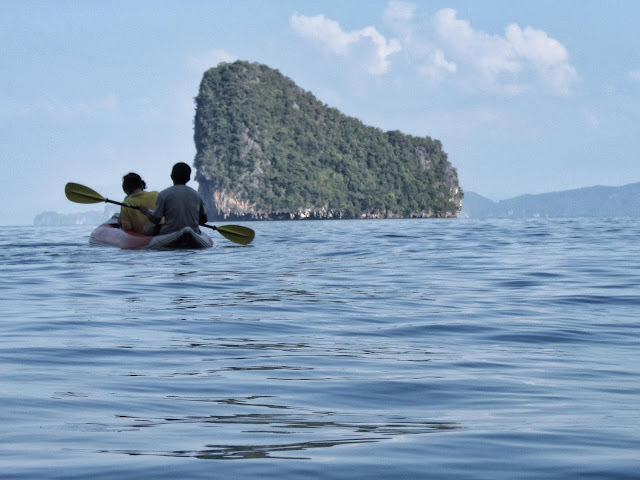 Phang Nga Bay is famous for its fascinating and beautiful limestone karats island.The best way to enjoy the limestone cliffs that jut vertically out of the emerald green water in Phang Nga Bay is by Kayaking. There are many tours which you can book from Phuket. The tour operator will take you near the Phang Nga Bay in a long tail boat or a motor boat from Phuket from where you can take a Kayak. Don't worry if you can't row a Kayak as you will get a professional in your kayak who will row you around the Phang Nga Bay. Cost : It will cost you approximately $45-$60 ( THB 1500-2200) for an entire day depending your bargaining skill and the tour operator.You can check John Gray's Sea Canoe which has amazing reviews on Tripadvisor but its costlier compared to similar tours you can book from tour operators in Phuket. When in Phuket ditch the swanky high end restaurants and relish some street food.You will find lots of options on the streets in Phuket starting from Sushi , Crepes , Pad Thai and lots of other food options. You can also taste many crazy sea foods from Sharks to Sea Snakes. Head to Malin Plaza which is near to the Patong beach approx 2kms. Outside Malin Plaza every evening lots of vendors set up their food stalls where you can relish the delicalacies that Phuket has to offer. Cost : You can have dinner starting $ 2.5 ( 90 THB) and goes up depending on what you want to have. Once in a lifetime opportunity you will get in Phuket is Kayaking in the caves of Phang Nga Bay.Take a Kayak tour and you can enter a cave inside the emerald green sea.You will be surprised to see the beautiful landscape inside the caves. You will not get lost inside the cave while kayaking as an expert guide will accompany you. Word of caution if you are claustrophobic then skip this.While kayaking inside a cave you might suddenly discover an island surrounded by the cliffs inside the ocean. 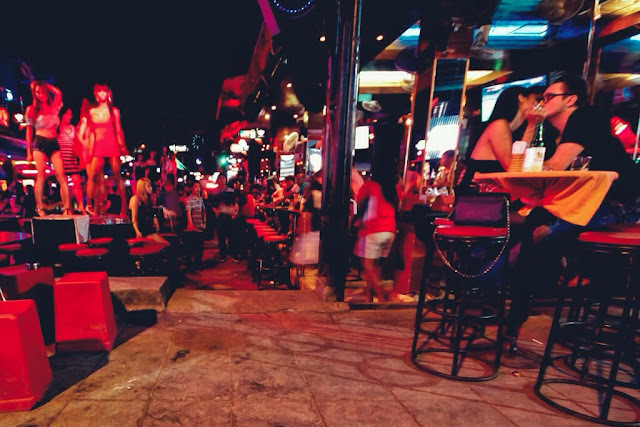 Crazy partying is synonymous with Phuket , Thailand. Head to the Bangla Road just near the Patong Beach where you will be greeted by neon lights emitting from pubs , discos , strip clubs , Go Go bars,Russian Dancers. Just sit with a beer in a bar and enjoy the atmosphere. You can walk endlessly on the Bangla Road and you will not get bored for a second. Caution while having a drink in a bar be cautious about travel scams. You can read about the travel scams and how to stay away in my blog post 10 Common Travel Scams and How to avoid it. Cost : A night in Bangla Road will easily set you back by $4 ( THB 150) atleast for a mug of beer and depending on how you want to spend the night it might cost you few thousand bahts. 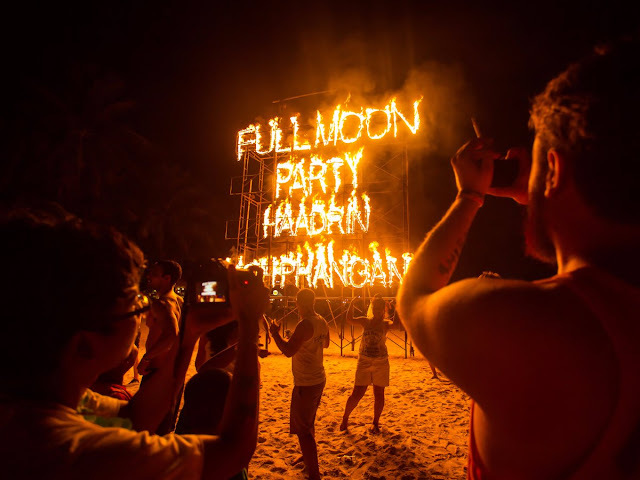 One of the best parties in the world and infact in top 5 party destinations in the world Koh Phangan is the place to head to.Every full moon the island of Koh Phangan hosts one of the craziest party in the world. 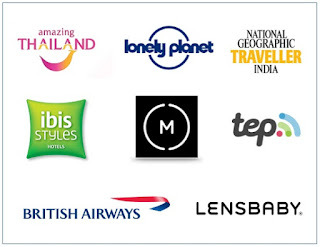 You can find many tour operators selling tour packages to the Full Moon party. Koh Phangan is approximately 7-10 hours by bus from Phuket. You can take a flight from Phuket to Koh Samui and take a boat ride for approximately an hour to Koh Phangan. The best way to enjoy is to plan to stay atleast one night in Koh Phangan, reach there by mid day relax & enjoy your day then head to party all night long, hit the bed by morning, leave back to Phuket by mid day. Check the Koh Phangan full moon party website to check the dates of the parties. 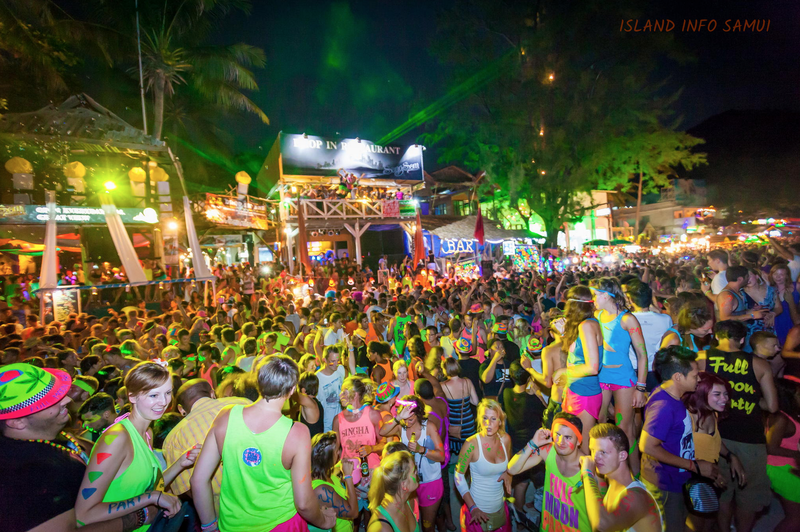 Cost : Partying in Koh Phangan will set you back by atleast $125 ( 4500 THB) all inclusive. If you want to see how old phuket used to look like then head to Thalang Road.Its around 15 Kms from the Patong Beach in Phuket and will take you approximately 30-40 mins reach there depending on the traffic. 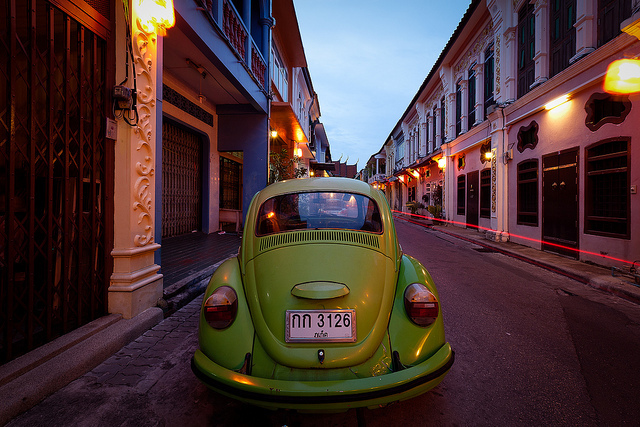 Thalang road, the historical heart of Old Phuket Town, has saved most of its old Sino Portuguese houses.Many old houses were refurbished and entirely rebuilt.You can find many little gems hidden here and there in the streets around.These old streets provide many opportunities to satisfy any photographer. Similan Islands is around 84 kms from Phuket and is considered among the Top 10 dive areas around the world.The islands are perfect for the tourists who like to dive and explore the remote and isolated islands full of wildlife.The largest island is Koh Similan and I suggest start exploring the Island from here. You can book many day trips to Similan Islands from Phuket which will include snorkeling.There will be a very early pick up from hotel around 6am for a day trip to Similan Islands. If you have time in your hand then stay for 1 night in Similan Island to enjoy more. When in Phuket snorkel to your hearts content. You can snorkel almost near all the beaches of Phuket. You can easily get snorkeling equipments from your hotel without any charges or else there are many shops in and around Patong beach where you can hire snorkeling gear for a day. Wat Suwannakuha also known as Buddha Cave Temple or Monkey Temple. It is a picturesque temple located in Takua Thung District, in the southern province of Phang Nga. Its approximately 80 kms from Phuket which will take around 1.5 hrs to drive. This Buddhist Temple is a mesh of connecting caves hosting a big reclining golden Buddha along with a number of Buddha statues and other cultural relics. 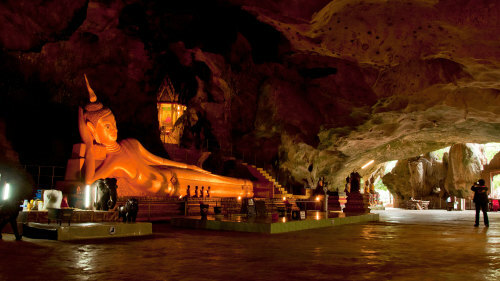 Visitors can see many monkeys outside the temple.Inside the main cave, the dominant figure is the large reclining Buddha. Cost : Entering the cave costs you 20 THB and going from Phuket to Wat Suwannakuha will cost you approximately $50-$60 per taxi for 6 hours. Again in Thailand the costs depends on how well you can bargain so nothing is fixed the taxi might ask you higher or lower amount. Head to any tour operator in Phuket and you will tons of leaflets offering various island tours.Going for an island tour is must when in Phuket as you will not only be able to enjoy the scneic beauty this place Phuket has to offer but also do many fun activities on board. The hot selling tours are mainly Phi Phi Island Tour and James Bond Island tour. In James bond island tour they will take you to Phang Nga Bay and you can add on the canoe tour also. I would personally recommend taking the James Bond Island tour and if you are staying for 2 days then take the Phi Phi Island tour also. Cost : The cost of these tours starts around $25 ( 900 THB) and goes upto $6 ( 2200 THB) depending on the number of islands they are taking you to and also the other activities which are included in the tour. On average try to bargain a tour below $45 ( 1600 THB) to get the best deal. Share your Phuket travel stories with shoestring travel by commenting below.